South Galway’s Yeats’ Mile was among the winners in this year’s Golden Mile of Galway Awards. Councillor Peter Roche, Cathaoirleach Galway County Council and Delia Colahan CEO of Galway Rural Development presented the Golden Mile of Galway Awards 2015 and launched the Golden Mile 2016 Calendar in Claregalway on Thursday. The overall winner of the Golden Mile was Lisheenaheilta Golden Mile Group, Glenamaddy. The Burren Lowlands Group, Gort, took home the Built Heritage award for the Yeats’ Mile at Ballylee. The Yeats’ Mile extends from Ballylee Cross to the Ballyaneen lios or fort. 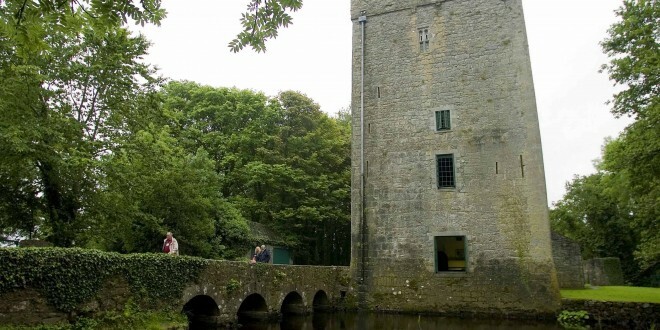 It is one of the most historic roads in the county as it includes Thoor Ballylee, an old mill previously operated by the Rowland family and restored in the 1990s and miller’s house, Yeats’ cottage which dates back to 1870, ring forts, a blessed well and 19th century farmhouses. Among those to have traversed the route were WB Yeats, Lady Gregory, the blind poet Raftery and the local beauty Mary Hynes, immortalised by all three. The natural heritage of the mile includes the Ballylee River which runs underground at Raftery’s Cellar, two turloughs and a rich variety of flora and fauna. The Burren Lowlands Golden Mile entry was coordinated by Adrian Feeney, Galway Rural Development, Sr de Lourdes Fahy of Kiltartan Gregory Cultural Society, pupils of Peterswell National School and the Nolan children of Ballyaneen as well as pupils of Kiltartan NS. The Ballylee Mile is included in the Finding Yeats 21km cycle route initiated this year by members of the Burren Lowlands in its Tourism Trails programme. Kilbeacanty Community Rural Development entered its mile from the village to Ballyturn Cross. The group was aided by workers from Solas, the local GAA Club and the Fishing Club in undertaking works and presenting their mile for the competition. The mile begins at the car park where there is an old pump accessed by stone steps. The mile passes Kilbeacanty National School which was founded in 1893. It continues to Saint Feichin’s Roman Catholic Church, built in 1839 and retains many attractive features such as the decorative hood mouldings and the imposing bell tower. The route passes McCarthy’s Bar and Lounge which has bird and bat boxes in the car park of the pub as well as mural on the side of the old phone box. Beyond the 129 year old GAA grounds the mile ends at Ballyturn Cross and memorial which was the site of the Ballyturn ambush on May 15, 1921. Councillor Peter Roche, Cathaoirleach Galway County Council said, “It is heartening to see the enormous voluntary effort, energy and hard work that the local communities and schools have put into this competition. One of the great elements of this project is that all age groups have been involved in various aspects of the work of presenting the Golden Mile for the competition. It is also wonderful to see that the Meitheal is still alive and truly working in County Galway”. Michael Burke, Galway Rural Development gave a presentation and photographic show of all of the miles that took part in this year’s competition. Ms Delia Colahan, CEO, Galway Rural Development said that the calendar “celebrates the commitment and energy of people living in small communities in County Galway; it also highlights their continuing strong links with the land and with each other. Roads in rural Galway have their own distinct personalities and stories and should be cherished, valued and preserved”.